A heated Murray Bridge round of the 2016 Motul MX Nationals saw Todd Waters (MX1), Caleb Ward (MX2) and Connor Tierney (MXD) stand atop the podiums on Sunday. It was a history making round for Wilson Coolair Motul Factory Suzuki’s Todd Waters who secured his first 2016 Thor MX1 round victory at round four of the Motul MX Nationals at Murray Bridge today. The Thor MX1 class was nothing short of attention grabbing from the minute the 450cc machines roared to life at Murray Bridge this morning, and with only a single point separating CDR Yamaha’s Dean Ferris from KTM’s Kirk Gibbs in championship standings entering the round, every race proved to be crucial. At the conclusion of the MX1 qualifying session this morning, it was KTM Motocross Racing Team’s Gibbs, SD3 Husqvarna’s Brett Metcalfe, NPE Monster Energy Kawasaki Racing Team’s Matt Moss, Ferris, and Waters who were the five riders to progress through to GoPro Superpole, and when each rider had put down their fastest individual laps, it was Ferris who not only maintained his championship lead but extended it by three points by taking the Superpole victory. When the Thor MX1 riders head out for their sighting lap ahead of race one, the wind had picked up and the weather conditions looked to have taken a turn, adding an additional factor for riders to deal with in moto one. When the gates dropped and the MX1 bikes launched down the straight, it was NPE Monster Energy Kawasaki Racing Team’s Kade Mosig who snatched up the MXStore holeshot, and despite suffering a huge crash at round three, held on to the race lead and was followed closely by Gibbs, Waters and Ferris. With only two laps in the books, Mosig continued to hold off his hard charging competitors, while Gibbs in second began to feel the pressure of points leader Ferris who had made his way past Waters to move in to third. With only five minutes of moto one run, thousands of spectators were treated to an epic battle for the race lead, with Gibbs finding Mosig’s rear wheel – however Gibbs was unable to make a pass stick, and within a lap Gibbs, Ferris, Metcalfe, and Waters were locked in to a four-way battle for second position, leaving the crowd guessing as to who would be able to make it stick. After five laps, the top five positions had changed, with Waters on a lightening fast charge, finding his way past Ferris and Metcalfe to move on to the tail end of Gibbs, while Gibbs too had put the foot down, and began to close the gap on race leader Mosig. However, it was Wilson Coolair Motul Factory Suzuki’s Waters who’s charge to the front proved to be unstoppable – making passes on both Gibbs and Mosig to move in to the race lead and take control of moto one. By the time the MX1 class had reached the halfway mark, the running order saw Waters out in front followed by Mosig, Gibbs, Ferris, and local Metcalfe. CDR Yamaha’s Dan Reardon, Moss, DPH Motorsport’s Jacob Wright, Crankt Protein Honda Racing’s Dylan Long and KTM’s Jesse Dobson completed the top ten standings. As moto one reached its final stages, and despite moving in to lapped traffic, Waters looked comfortable holding the MX1 race lead, however Mosig was in no way ready to settle for second position, and with just over five minutes remaining showcased his second wind and began to apply the pressure on Waters. However, the attention quickly shifted back to the battle for third place, with Ferris making a late charge for additional championship points, passing closest threat Gibbs, and then joining the battle for the top spot with Waters and Mosig. And with only one lap remaining, race one for the Thor MX1 class was set up to go down to the wire, with Waters, Mosig, Ferris and Gibbs all within striking distance of each other and hanging it all out in a bid to take the race one victory. But when the chequered flag flew it was Wilson Coolair Motul Factory Suzuki’s Waters who took a narrow victory from Mosig, while CDR Yamaha’s Ferris held on to finish third, followed by KTM mounted Gibbs who wrapped up race one in fourth. When the second race of the day got underway for the Thor MX1 class, there were battles left right and center as the championship standings tightened up, but to fans excitement it was local star Metcalfe who got to the early race lead, followed by Ferris and Gibbs who slotted in to second and third behind him. With two laps in the books, Metcalfe looked in no way to be easing off the gas, continuing to lead from red plate holder Ferris, and Gibbs, while Wilson Coolair Motul Factory Suzuki’s Waters also joined the party in fourth. It was heading in to lap three that Ferris began to apply the pressure on Metcalfe, taking some drastically different lines in order to close the gap, but Metcalfe was not prepared to hand it to him, holding off the Yamaha mounted rider and putting on a performance for his home crowd. By the halfway mark in moto two, the running order saw Metcalfe continue to lead from Ferris and Gibbs, while Waters maintained fourth position ahead of Moss. Race one second place getter Mosig looked comfortable in sixth position, while Wright, Long, Dobson, and Daniel Banks completed the top ten standings. In what was a shock to onlookers, CDR Yamaha’s Ferris crashed on lap seven, forcing him to drop two positions, allowing Gibbs and Waters to inherit a position each and move in to second and third. As the Thor MX1 class approached the final stages in moto two, fans were treated to an exciting battle for the race lead, with former South Australian local Gibbs and Metcalfe going head to head in a heated on track battle, making it anyone’s guess as to who would take the final race victory. But by lap 14, with time to spare, Gibbs got the job done – making the pass on South Australian Metcalfe and moving in to the moto two race lead. From there Gibbs was unstoppable, leading all the way to the finish and allowing the fight for remaining positions to happen behind him. So when the chequered flag flew for the final time, it was Gibbs who wrapped up the final Thor MX1 moto for the day with the win, followed by SD3 Husqvarna’s Metcalfe who concluded his final Motul MX Nationals race for the year in second, while Wilson Coolair Motul Factory Suzuki’s Waters wrapped up the final MX1 race of the day in third. However, when points were calculated it was the 1,3 race results of Waters which awarded him his first Motul MX Nationals round victory for 2016, ahead of KTM Motocross Racing Team’s Gibbs who wrapped up round four in second as well as securing the MX1 championship points lead, while Metcalfe finished his last MX Nationals round in third place on the overall Thor MX1 podium. “It feels awesome to finally get a round win here at Murray Bridge – we were close at Broadford but we got it done here today so I’m stoked,” he said. “With a win in moto one, I just tried to ride a smart race in the second one – I knew that I just needed to get third so I did what I needed to do and finished with the round win. 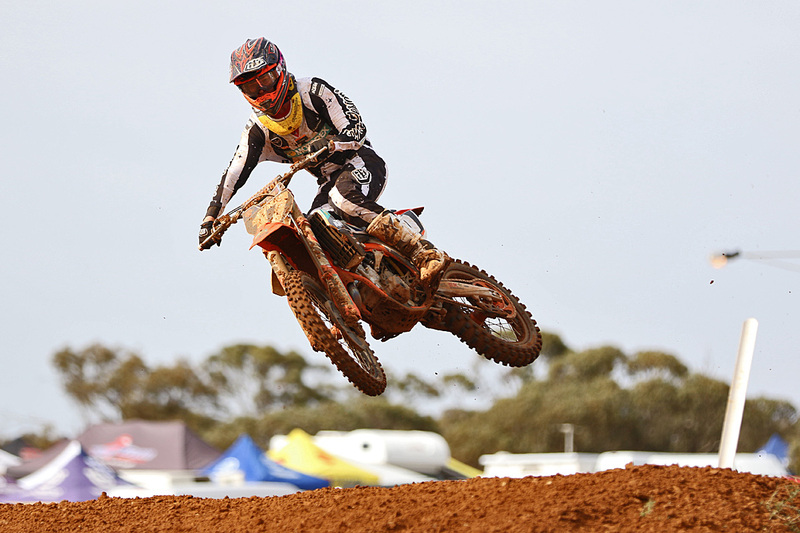 The Motul MX Nationals will now begin preparations for round five of the championship, being held at Wanneroo in Western Australia on May 28 and 29, 2016. Windy, challenging conditions tackled in South Australia. A disruption to the timing and scoring system delayed the opening MX2 moto results, however once officially finalised it was Caleb Ward (KTM Motocross Racing Team) who was confirmed as the moto winner. Ward overcame red plate holder Jed Beaton (DPH Motorsport Yamaha) for the victory by around 17 seconds, while early leader Nathan Crawford (Husqvarna) completed the podium. Top of the two-strokes was Jayden Rykers (Davey Motorsports KTM) in fourth, closely trailed by pole-setter Wilson Todd (Serco Yamaha). Positions six through 10 were completed by Jake Moss (National Pump Monster Energy Kawasaki), Dylan Wills (Raceline Pirelli KTM), Dean Porter (KTM), Richie Evans (Yamaha) and Keiron Hall (Yamaha). Wade Hunter was a notable non-finisher, going under observation by RACESAFE, while Luke Arbon (SD3 Husqvarna) didn’t start following his injuries sustained testing on Saturday. A convincing performance from Ward saw his sweep the round with the moto two victory, making his way to the lead in the opening half of the race and he was never headed. It was the ultimate way to bounce back for the title favourite following a horror Broadford round, topping Crawford and opening laps leader Moss in the race. Beaton was directly behind for fourth at race’s end, while Porter turned heads to complete the top five. Wills, Todd, Hamish Harwood (Davey Motorsports KTM), Joel Wightman (Honda CRF Racing) and Hunter were the top 10 finishers. Overall for the round it was Ward who stood atop the rostrum, with Crawford second and Beaton third. It’s still Beaton who remains at the head of the standings, one point ahead of Crawford, while Moss is third. Ward moved back to fourth, now 20 outside the lead. In the opening MXD moto of the round points leader Connor Tierney (MXR&D Husqvarna) took victory by a comfortable margin of over five seconds, with Jordan Hill (Yamalube Yamaha) and Cooper Pozniak (KTM) following him across the line. Fourth was Wade Kirkland (Raceline Pirelli KTM), while Kaleb Barham (SD3 Husqvarna), Zak Small (Husqvarna), Lochie Latimer (Yamaha), Levi McManus (Suzuki) and Tyler McCoy (Yamaha) filled the top 10 placings. The final MXD moto was won comfortably by Evans, the factory-supported YZ250F rider over 20 seconds ahead of the field in a strong finish to his round. However it was second in the race for points leader Tierney that sealed him the round win, extending his championship advantage in the process. Joining the duo on the podium was Kirkland, followed by Pozniak, Barham, Justin Hart (Husqvarna), Small, McManus, McCoy and Sam Pelz (Yamaha). For the round Tierney topped Kirkland and Pozniak, also leading the series from the same pair.